Medical and surgical research is breaking boundaries at an astounding pace. From genetic modification and stem cell therapy to robotic and 3D printing technology, scientific advancement is finding novel, unique and unprecedented solutions to complex, challenging diseases. Indeed, such is the rate of change that I am certain the last eight years of my surgical training in the UK will likely be rendered obsolete within the next twenty years of amazing, exciting, ground breaking advancements. However, despite these ongoing achievements, I fear we as a scientific community have a much greater challenge ahead of us – a frontier of medicine and surgery that has been largely ignored for many years. 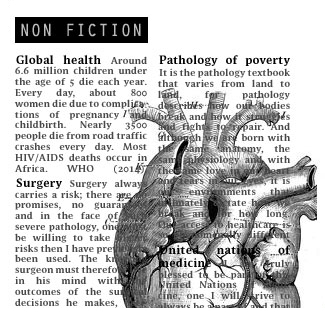 In 2015, The Lancet Commission published a startling study describing the state of global surgery and that five billion people across the world lacked access to safe surgery. 33 million per year were quoted as sustaining catastrophic financial hardship as a result of having surgery. Although these numbers are hard to truly absorb, they trigger a deep connection within me – my travels since 2008 allow me to put people’s stories and faces to those horrendous statistics. I remember the spinal victims of the Haiti earthquake, recovering in an electricity-less building, or the Haitian teenager walking down the street, carrying her books awkwardly, standing on two neglected deformed feet. I remember the children and teenagers of South East Asia, seeking help of their bone cancers when it was all too late, and even the success story of the sweet girl in Myanmar, who dreamed of being a fashion designer, left her father smiling despite losing his livelihood to pay for treatment. Sadly, these images have stayed with me from the moment they entered my vision and the Lancet Commission’s numbers are all too familiar to ignore. Humankind has indeed become advanced – scientific research creating a colourful mosaic filled masterpiece of knowledge but it is only a small proportion of humanity who are benefitting from this wonderful tapestry. Our greatest scientific challenge however is not just the pursuit of more answers to complex puzzles but also ensuring those billions of people left behind are also in the jigsaw set. The plight of the surgically and medically neglected is the truest heartache of our healthcare generation and I believe the final frontier of surgical disease on this planet. Today I have left to return to Cambodia, a country I fell in love with during my visit of 2013. I have now completed and formalised my surgical training in the UK and venture forward for further challenges with like-minded and inspirational colleagues. And yet travelling to this surgical frontier comes at a cost. A traveller is often broken in to two pieces, one piece remaining in the place where he has departed and the second goes forward to where he is going. I said goodbye to my family with a lump in my throat and a stone in my heart, knowing I would miss aspects of my nephews’ and nieces’ childhood, or not being around to assist my parents if they ever need me. A few tears have already left my eyes as I type this letter on the airplane. However, it only motivates me to work harder, for if I am losing a jigsaw piece in one location, I should make up for it by helping to put pieces together in the other. As travellers, wherever we are, our individual time in a single place is limited, our individual impact on our surroundings limited, our personal contribution to the lives of others is limited. It is only by travelling together, united that we can make meaningful, long lasting change and so despite ending my last letter from Haiti promising to stop writing, for I had found my peace in the world, I will continue writing to anyone who reads with me, so that we may stay always connected, share our jigsaw pieces, and ultimately travel together to our own individual frontiers.